Favourite Track? : For experience it has to be Qatar under the flood lights. For pure bike riding - Mugello. Would you rather win the MotoGP title or IOM TT senior title? : Moto GP tittle 100% - I love the professional/technical side of GP but that’s with no disrespect to the IOM boys! Best memory on a bike? : My favourite memory has to be going across the line to take the 2015 Superstock 600 championship. Best memory off the bike? : Best memory off the bike has to be my championship winning party at the end of the 2015 season. Any pre-race rituals? : Pre race rituals for me are making sure I’m fed and watered. Nothing superstitious. What do you get up to when you are not racing? : Away from Racing I engage myself into a lot of training, cycling, swimming, rowing, running.. etc etc. I maintain a balanced social life with friends and family and enjoy the odd spontaneous trip here and there. Favourite music Artist/ band? : I enjoy a wide range of music but nothing to heavy. If you could have 1 single super power what would it be? : My superpower would be the ability to fly. Saves on my spontaneous trips away and makes Cadwell mountain that little bit more exciting! If you were going to be stranded on a desert island what 3 things would you take? : If I were stranded on an island I would take fresh drinking water, enough meat for a decent open fire BBQ and some sun cream. Because let’s not forget my newly found super power! Stay the night and then fly home! Who is your biggest inspiration? : There isn’t ‘one person’ I am always inspired by the work our emergency services do. Biography: Mason Law was born in 1995 and started his racing career in 2003 competing in Motocros until 2012 when he started competing on tarmac he was the 2015 National SuperStock 600 Champion. 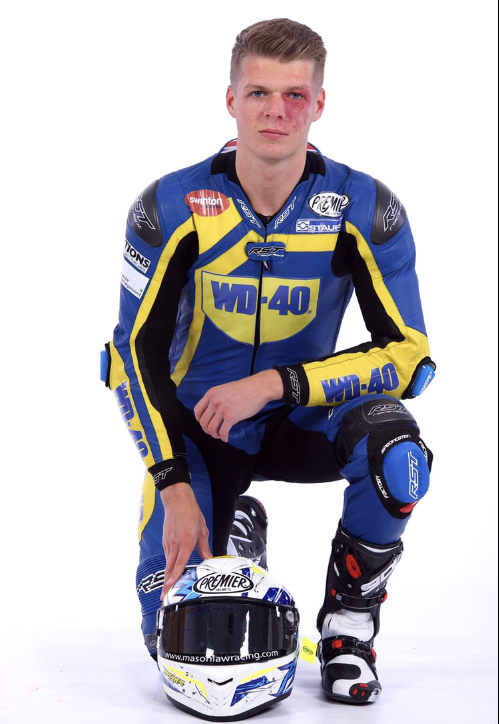 Mason has mad the leap up to British Superbikes for 2018 and will be racing for the Team WD40.